Today marks an important step in NASA’s commercial crew program: the first pad abort test for SpaceX’s new Crew Dragon vehicle. The 2-minute test will run the capsule through emergency procedures that would fling astronauts free from harm’s way in case a launch goes catastrophically amiss. Having trouble with the feed? Try an alternate video livefeed, the mobile feed, or an audio-only feed. You can also follow along with the SpaceX livestream here. Update: Missed it? Rewatch the pad abort flight test. The purpose of the pad abort test is to check systems that would automatically fling astronauts to safety if something went catastrophically wrong during launch. However, for the first test the pad abort test is uncrewed with no humans are at risk from the experiment. A test dummy will be aboard the flight; despite popular misconception the dummy is not named Buster; its name is currently unknown outside the company. T-0: Eight SuperDraco engines on the capsule ignite, propelling the spacecraft from the pad as they reach maximum thrust in purely vertical flight. T+0.5s: Engines throttle down as the Crew Dragon’s pitch away from vertical and towards the ocean. T+5s: The abort burn continues until the Dragon is out of propellent. The spacecraft continues to coast upwards for just over 15 seconds, reaching a peak of 1,500 meters (0.93 miles) over the launch pad. T+21s: The spacecraft jettisons the trunk (the unpressurized cargo area), slowly rotating to orient so the heat shield is facing the ground. T+25s: Drogues (small parachutes) deploy, stabilizing the capsule. T+35s: Three main parachutes deploy, slowing the vehicle. T+107s: The Crew Dragon splashes down in the Atlantic Ocean approximately 2,200 meters (1.4 miles) downrange of the launch pad. Assuming the test flight is successful, the next step will be for SpaceX to perform an in-flight abort test from a higher starting altitude. Unlike most pad abort systems that fire astronauts to safety in case of an unexpected disaster near launch but then quickly becomes useless with altitude, the system on the SpaceX Dragon’s system can abort a flight and bring astronauts to safety up until the spacecraft enters orbit. Update: With both weather and equipment in the green, the test flight went down exactly on schedule at the start of the launch window. All expected steps performed at least roughly to plan, with the engines launching on time (although boosting the capsule to a speed “slightly below nominal”) and the drogues and parachutes slowing the vehicle before splashdown. From the stream-chatter, it appears the overall distance covered was shorter than expected, but not catastrophically so — the crew of imaginary astronauts were still carried to safety. While it’s going to take longer for SpaceX to receive, review, and analyze data from this test flight, from the outside everything looks great! An escape route like this was standard during the Gemini and Apollo launches, but astronauts lacked the capacity to bail out of a bad flight with the space shuttle. It is now a mandatory requirement for both the SpaceX and Boeing commercial crew vehicles, and for NASA’s Orion spacecraft. Successful completion of the pad abort test earns SpaceX $30 million from NASA as part of the multi-stage commercial crew vehicle contract. Earlier systems on Gemini, Apollo, and even the current Soyuz spacecraft used a top-mounted system mechanisms that pulled the capsule to safety during emergencies, but the design necessitated the abort system be jettisoned before the spacecraft reached orbit in normal flight. By relying on rockets mounted at the base of the capsule, the Crew Dragon’s abort rockets do not need to be jettisoned during flight, allowing for an abort at any point during pre-orbital flight. The next major test will be an in-flight abort test, with the capsule separating from the main spacecraft and a Falcon 9 rocket mid-flight from high altitude instead of during the launch sequence. 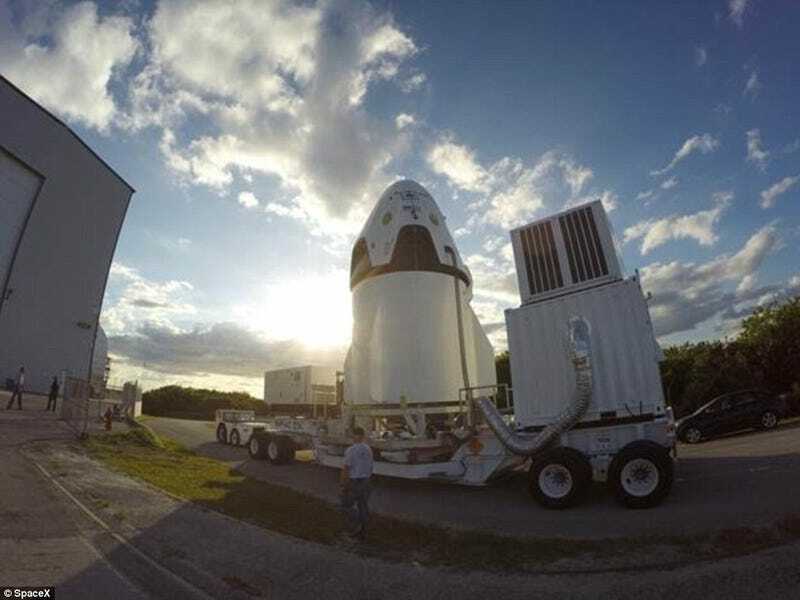 Eventually, SpaceX plans to use the same eight SuperDraco engines to soft-land the Crew Dragon after successful missions.